Induction brazing is the joining of two or more metals using electromagnetic fields to provide flame-less, contact-less heat. Compared to torch heating, induction brazing is highly repeatable, more localized, and easier to automate. While brazing with induction heating, the importance of cleanliness, degreasing as well as the removal of any oxide films on the surface of the parts cannot be over-stressed. The surface finish affects the flow of the brazing material. A rough, corroded surface will result in globs of braze alloy throughout the joint area. Brazing with induction heating is often the preferred joining method because of the aforementioned benefits. 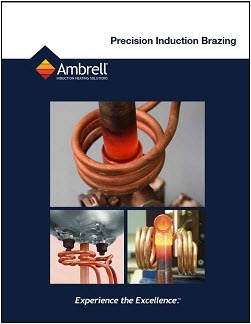 Continue reading to see some pointers regarding brazing with induction heating. Also, be sure to check out our brazing applications page. A good fit assists in heat conduction between parts and helps to prevent overheating. It also requires less brazing material for the joint. Typical joint clearances range from 2-5 thousandths of an inch for good braze joints. The brazing operation should be such that the parts to be joined are heated uniformly at the joint areas. Induction heating coils should be arranged so that maximum energy is directed towards the heaviest mass, when brazing a thick and heavy part to a small thin part. Differential expansion between two dissimilar materials being joined can sometimes introduce difficulties. This particularly applies when a brass part is fitted inside a steel part. During the cooling cycle brass contracts away from the steel and causes cracks in the braze joint. The same effect can occur between steel and tungsten carbides - a common material combination in cutting tool industry. The work coil needs to be designed to deliver uniform heat to both the outer and the inner tubes in order to ensure that the outer tube does not expand and move away from the inside tube. Silver brazing alloys are extremely fluid above 650 °C and tend to flow in the direction from which heat is applied. Whenever using braze rings they should be positioned either partly or wholly in a chamfered recess so that they are shielded from direct induction heating. There is also a danger of the braze alloy melting before the joint reaches brazing temperature. The alloy should be in form of an open ring, which is more difficult to heat with induction than a complete loop. The ring should also be a tight fit to the part, and if necessary flattened to increase the surface area in contact. Sometimes it is recommended to use two rings of a much smaller wire than one ring of a larger wire diameter. The power setting and the exact heating time are normally determined experimentally. Once established for a particular component, they will produce consistent good parts without requiring external temperature control. It is usually preferred to heat several parts simultaneously to achieve a given production rate than try to reduce the cycle time for one part. When considering the production rate required, emphasis is often placed on the heating time while the cooling time is often ignored. This may be justified for a good number of applications; however, larger components require cooling time as much as if not more than the heating time. Cooling time can be reduced by the use of compressed air, etc. Induction heating is a fast, efficient, precise and repeatable non-contact method for heating metals or other electrically-conductive materials. The material may be a metal such as brass, aluminum, copper or steel or it can be a semiconductor such as silicon carbide,carbon or graphite. To heat non-conductive materials such as plastics or glass, induction is used to heat an electrically-conductive susceptor, typically graphite, which then transfers the heat to the non-conducting material. 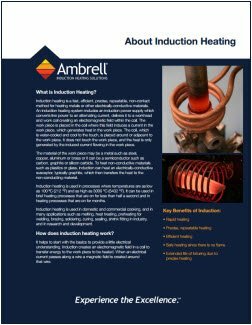 Read our 4-page brochure; learn more about how the science of induction technology can solve your precision heating problems. The work coil is the component in the induction heating system that defines how effective and how efficiently your work piece is heated. 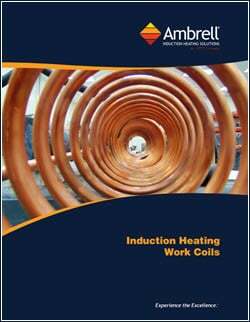 Provide a little of your business contact information to read our informative brochure explaining the fundamentals of induction coils and their design. Brazing is a process for joining two metals with a filler material that melts, flows and wets the metals’ surfaces at a temperature that is lower than the melting temperature of the two metals. Protection from oxidation of the metal surface and filler material during the joining process is achieved using a covering gas or a flux material. Brazing and silver soldering are terms that usually refer to the joining process where the filler materials have a melt temperature above 400°C (752°F) to create a stronger joint. Read more in our 12-page brochure.